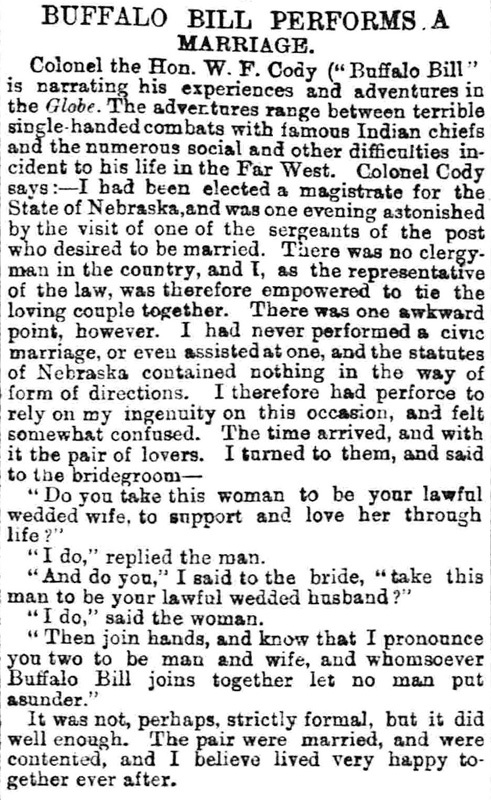 BUFFALO BILL PERFORMS A MARRIAGE. "Do you take this woman to be your lawful wedded wife, to support and love her through life?" 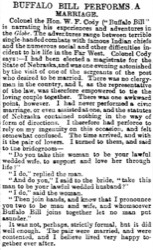 "I do," replied the man. "And do you," I said to the bride, "take this man to be your lawful wedded husband?" "I do," said the woman. "Then join hands, and know that I pronounce you two to be man and wife, and whomsoever Buffalo Bill joins together let no man put asunder." It was not, perhaps, strictly formal, but it did well enough. The pair were married and were contented, and I believe lived very happy together ever after.